The Emerald's vision is as unique as it is simple - to create an exclusive expatriate community of North American character in Shanghai's Pudong new development area. Our philosophy extends far beyond this goal, to encompass an attention to detail and refinement that can be appreciated anywhere in the world, to create a space that even the most discerning expatriate would be proud to call home, to provide a standard of living and level of comfort that only approximates that of North America, but perhaps exceeds it. Whether it be the distinctiveness of the house and garden concept, or the innovative and eclectic design style, we are sure that you'll find that The Emerald exceeds your expectations. Be it the innovative design and imported fabrics or the community events we organized for you, we are convinced that you'll find our homes comfortable, familiar and uncompromising. In fact, we are confident that The Emerald represents North American living in a way that you never thought possible in Shanghai. Covering nearly 360,000 square meters of land area, the Emerald consists of five development phases with 236 units of elegant North American style villas. Since its first phase of development in 1998 the Emerald has been widely known as one of the most coveted addresses among the prime international villa compounds in Shanghai and has gained a widespread reputation as the first choice of many Fortune 500 companies'senior executives and consular officials of various countries. At the present, the Emerald is proud to host residents from nearly 40 countries. Within the compound, the villas are all gateless and come with open and spacious front yards and large back gardens. The villas range in size from small units fit for a family with two children to very large units that come with multiple bedrooms and their own private indoor or outdoor swimming pools. The Emerald is also famous for the size and beauty of its landscape and greenery areas, something that no other international residential compounds can match. 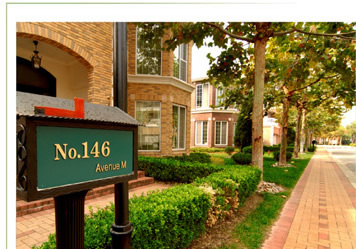 The Emerald - where the often quoted "Home Away From Home" is a reality.